From above picture you can see that this program calls the function atoi() to convert a string “5” to an integer and stores it to register esi, and later it compares the esi with number 5 and jumps if it does not match. This conditional jump makes no sense because the esi should always equal to 5! However, if the jump does not take place, the program will just terminate itself. So let’s ignore this logic and just see what will happen if it jumps to the unreachable branch. 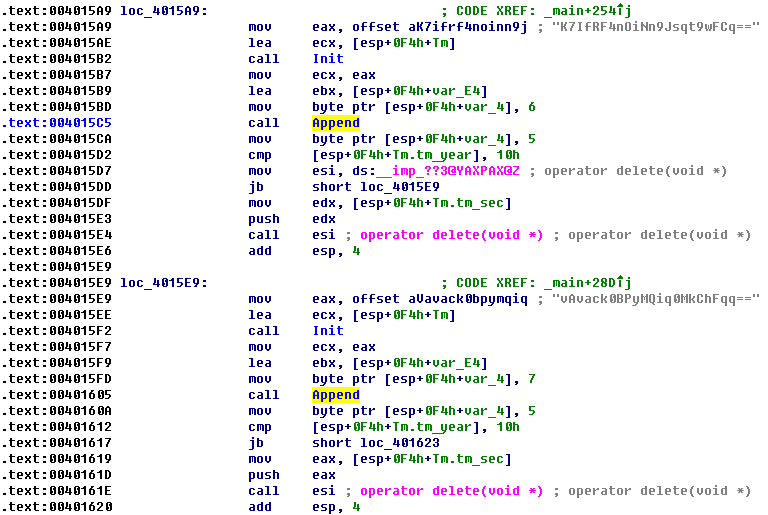 By observing the output of the script, we can find that those Base64 strings in this program are actually Base64 encoded MD5 hash of byte 0x00 to byte 0x17 (0 to 23), with all the uppercase letters changed to lowercase letters and all the lowercase letters changed to uppercase letters. That is to say, those Base64 strings are encoded with a different character set than the standard Base64 character set. Now we have only one question left: which Base64 string will be picked out to compare with the hash calculated from our input? If you look back to the previous code, it is easy to answer: it is determined by the time, or more precise, the current hour (and that’s why it only need value from 0 to 23). Obviously, there is nothing useful. So I have to continue with the disassembly code to see what is going on. 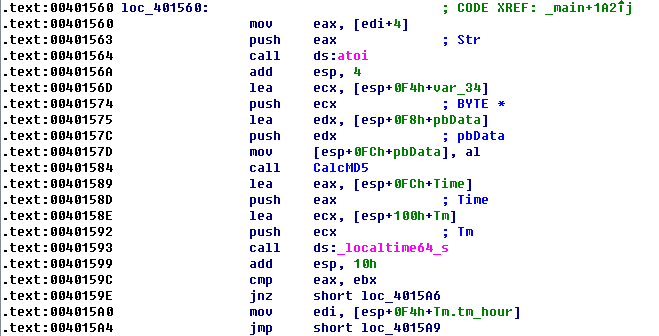 After compares the MD5 hash, another branch of Base64 strings are initialized and “appended” to another list. Then one of the Base64 strings will be picked out and decoded, and then XORed with the previous Base64 decoded data. Finally, the XOR result will be printed out. Wait, the final output depends on the previous Base64 data, and the previous Base64 decoded data should match the MD5 hash of our input (from 0 to 23). 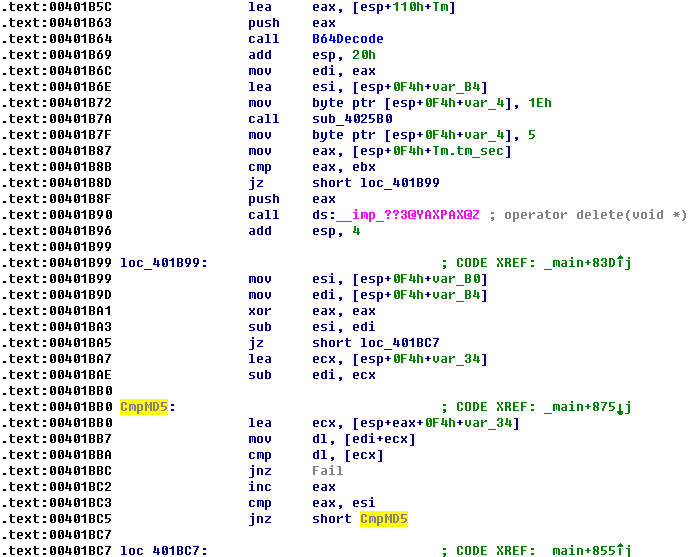 However, according to current analysis, the first set of the Base64 strings seems uses a different character set than the standard one, if we decoded it using the standard Base64 character set which used by this program, the MD5 hash will never match! What is the problem here? I must missed something! Share the post "FLARE On Challenge (2015) #4"